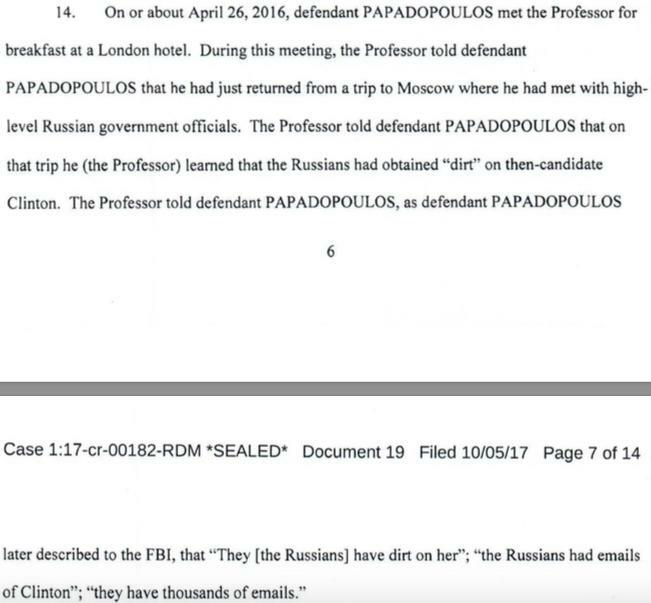 Papadopolous sounds like the kind of incompetent dumbass that Trump would love. I’m surprised he wasn’t put in charge of some important government agency. Unrelated: Papadopolous and Manafort cheated on at least $75 million in taxes. I wonder whether part of this is going to result in the FBI getting Trump’s tax returns. One thing everyone seems to forget about those: Trump has them but so does the IRS. One need not ask Trump for them. The whole thing around releasing Trump’s taxes is a charade. Liddy ran the Watergate operation, not Iran/Contra. fusilier, who’s old enough to remember both in real time. You’re right! I’m also old enough to remember but I didn’t, because I was ignoring politics at that time. They are all the former until they become embarrasslly public and/or go wrong when they become one of the latter. The thing about the “Russians manipulated Americans” take is that even if it’s true you still have a problem of 63-million credulous bumbleheads with disproportionate voting power due to the electoral college. It’s like, yes, maybe it would be nice to catch the arsonist that set our house on fire, but can we talk about how the homeowner waters his garden with accelerant? To be honest, the Papadopolous story is so far fetched that it makes me even more dubious of an official Russian involvement. I don’t know if anyone here has read the old Sax Rohmer novels but his story could be taken from one of them. Currently I see three likely possibilities with about equal probability: 1) the story including the official Russian involvement is true, 2) someone, for various reasons was playing him for a fool—clearly not difficult—and rolled him into an on-going operation that may or may not have had any Russian involvement and 3) the FBI has managed to manufacture some thrilling tale either deliberately or accidentally. Note I am not American and have no particular respect for the FBI, a barely competent and overly politicized organization so I have no problem thinking they may have mucked up again. In any case, Papadopolous needs to go along with the current official story to get out of prison before he qualifies for the Old Age Pension. @jrkrideau, #6: Sax Rohmer! Now *there’s* a blast from the past. I read those books when I was a kid. I doubt I could do it these days. The casual racism is hard to overlook. To be honest, the Papadopolous story is so far fetched that it makes me even more dubious of an official Russian involvement. To the earlier discussion about whether you need to be smarter than someone to fool them, apparently Papadopolous is arguing my point. I still don’t think the intelligence agency’s claims about this are worth a hill of beans. There’s something fishy about people who should be able to prove their point but instead go out of their way to make their “proof” nothing but smoke and mirrors. It makes me uncomfortable accepting anything about the matter until I understand what their motivations are for pushing such a shoddy sales job at me. It’s the sequence of events and the difficulty in faking them, that convinces me. Unless I were to go full monty conspiracy theorist and hypothesize that the “Russians” were agent provocateurs, it’s kind of hard to reject the fact that clearly everyone (including the Russians, now) seemed to think the Russians were in on it. Agreed. I trust the FBI as far as I can comfortably spit a live rat. And I don’t even trust the CIA or NSA that far. … Papadopolous and Manafort cheated on at least $75 million in taxes. No, just the taxes due on $75M of income: presumably less than 100% at the time, though possibly more than that now. It makes me uncomfortable accepting anything about the matter until I understand what their motivations are for pushing such a shoddy sales job at me. I caught a part of a clip on CBC Radio news this morning where reportedly the evil Russians were buying social media time and paying in rubles. Hello? I realize that intelligence agencies can be amazingly inept but paying in rubles? Why not just add a note to the social media post saying “This public service announcement brought to you courtesy of Vladimir Vladimirovich Putin”. On the other hand I have no problem crediting Trump and his origanization with all sorts of dubious financial dealings with Russians and citizens in other former republics of the USSR. I read in the Washington Post that the Orange One is upset that Mueller’s investigations are extending to Trump financial dealings. I wonder why? Vladimir Putin’s regime has become increasingly adept at deploying a whole range of practices that are more common among crime syndicates than permanent members of the UN Security Council. “It’s not so much a mafia state as a nationalized mafia,” Russian organized crime expert Mark Galeotti, a professor at New York University and co-host of the Power Vertical Podcast, said in a recent lecture at the Hudson Institute. The rubles thing certainly sounds telling but realistically is probably the weakest, most useless detail. The whole, rather large country uses rubles, it’s not like it’s an IOU direct from their intelligence agency. Facebook may well have a non-trivial amount of legitimate* advertising that’s paid for in rubles. Even if they don’t, that’s the kind of detail that raises flags only AFTER something problematic has happened. In other words, it’s “common sense” but only if you look just at that example and don’t look anywhere else or think about it too hard. “Based on a conversation that took place on or about March 6, 2016, with [Sam Clovis] Papadopolous understood that a principal foreign policy focus of the Campaign was an improved U.S. relationship with Russia.” … This exchange happens a few weeks before Trump hires Paul Manafort. … I suspect most people in early March, even reporters following the campaign closely, would have been highly surprised to hear this, notwithstanding Trump’s and Putin’s mix of chummy statements about each other. It wasn’t clear Trump really had any foreign policy at all. the Kremlin is explicitly hiring criminals to do their dirty work, as it makes attribution much harder. Since I’ve been in the position of having to recommend extremely expensive actions to clients, based on this sort of analysis, I can’t go by feelings, I have to hold the line and demand the strongest possible attribution before I recommend an action. Unfortunately, we’ll probably eventually see a war because someone went by “yeah, probably” and mis-attributed. We need to hold the line on this stuff because we are potentially condemning people to death. Please bear that in mind. I usually keep asking myself “how can I tell this from a false flag operation?” Well, as we now know, the Iraq war as in part triggered by Israeli-provided falsified documents. We still don’t know if the Israelis falsified them, but … probably. To me, what’s scary is how easily one could generate a false flag operation on the internet (the easiest approach would be to have an insider, which is basically what the FBI did to the Weathermen and Black Panthers during COINTELPRO) If I want to imagine scary scenarios, they are much scarier than the current reality, which keeps me in check.